Classic damask is luxurious, traditional and incorporates beautiful textures in the form of heavy silk or linen and in their Damask Rug Collection, Nourison have replicated traditional Damask designs and made them into beautiful and elegant rug designs for your home. 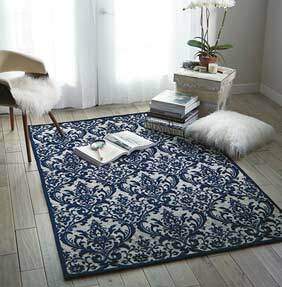 The Damask Rug Collection is elegant and adds comfort and warmth to your space. All the rugs have a luxurious feel and a classy finish which make them a wonderful addition to your home. They incorporate classic patterns but the way in which they have been designed ensures they work in modern interiors and homes of all styles. Soft and elegant, the Nourison Damask Collection incorporates gentle, balanced and neutral colourways. The rugs designs are refined and understated and extremely versatile, bringing pattern and texture to your home. Each rug is elegant jacquard woven and provides area cover for your home. Each rug is available in a choice of different sizes to suit all homes. Each of the Damask Collection rugs features intricate and ornamental fleurs-de-lys patterns and the classic finesse and style you would expect of a quality damask design. They bring drama to your home without becoming overwhelming and can be the design piece which brings together the whole feel and mood of a room. Each rug is finished with a slender ribbon border which completes its contemporary look. There is a choice of different styles of Damask rug, with various simple and neutral colour palettes to enjoy. The combination of different styles and sizes means this collection is a highly versatile choice and can be enjoyed in many different homes.